The tortuous prose of this novel splays across endless pages, progressing slowly, determinedly, and hellishly toward a small town’s ruin. Whither the town? Hungary, I guess. But if you don’t see something of your own neighborhood here, then you’re not paying attention. 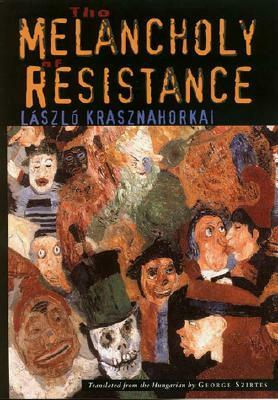 There’s a point in the first few pages of The Melancholy of Resistance where you’ll find yourself breathing somewhat audibly, perhaps at an accelerated pace, matching the sweep of your eyes as they tear through the pages-long sentences of Krasznahorkai’s pen. The narrative begins in a confined, cramped space — the inside of a truant train packed with dirty country bumpkins — and cultivates a palpable sense of dread. The character of interest is a middle class suburban widow who should be calling to mind your own mother, if not in degree then at least in kind. She’s better off, classier, and fussier than the other passengers on the train and she begins to get nervous. There’s a man sitting near by. He’s watching her, flirting with her, follows her down the aisle when she runs into the bathroom. She sits on the toilet as he bangs on the door, demanding some sort of hasty sexual encounter, the train moving all the while through a dark and cosmic country landscape that it should have cleared hours ago were it not for the unexplained (but not unanticipated) delay. It’s really frightening stuff. The woman manages to escape and makes her way home safely. But by the end of the novel, she’s dead anyway. Raped and beaten, left on a freezing sidewalk, she’s buried unceremoniously right before The Melancholy of Resistance closes out with a biologically exacting account of her decaying body. There are many other people in this novel, many other happenings, and a considerable degree of dynamism. But the message is clear enough in these opening and closing scenes. The world will have its way with you; your life is not secure; and maybe even: cause-and-effect thinking makes sense biologically, but certainly not socially. There are a great many things written into the plot of this novel for which there can be no accounting. During the same evening as the aforementioned train’s arrival into a small Hungarian town, a circus (loosely speaking) also arrives. It bears one central attraction: the stuffed and preserved body of a dead whale. Like particularly malevolent and group-thinking zombies, a ragtag bunch of foreigners follows the circus into the town’s main square and idle away the hours. They look and speak roughly, pulse with energy as a single mass, and collectively portend disaster for the town. The local population becomes increasingly paranoid as the circus opens its doors to dismal reviews and the mother of all anticlimaxes. What’s drawn the mob to the circus? What is the real intent? The intent is complicated to suss out and adequately motivate. That’s fine. What’s important to the story is the end result: the overnight sacking of the town, its inhabitants, and its physical plant by this otherworldly horde. The townsfolk’s worst fears are realized in resplendent fashion and Krasznahorkai lets loose with a cosmically (but ill-defined) evil the likes of which dot the pages of any good Bolaño or McCarthy novel. In the aftermath of the event, the more autocratic among the town’s survivors set up a totalitarian police state in an effort to guard against the future possibility of repeated devastation. Aside from making the day-to-day routine intolerable in the town, however, the effort is clearly lacking. When the dead whale circus comes to town, no social order is going to save you. Okay, so it’s an exceedingly odd book. This can occasionally work against its broader message. But one of the benefits of the approach is the range of highly varied characters that confronts the reader. One of the protagonists is a mental space cadet who spends more time considering the cosmos than engaging with the empirical reality that surrounds him. He is the most sympathetic character in the novel and is ultimately dealt with somewhat harshly by Krasznahorkai’s horde. Another of the protagonists is an aging musicologist who has retreated into the isolation of his domestic life because he finds the town and the impending storm too difficult to manage. Then there is the totalitarian and cruel woman who seizes the helm of the town when presented with the post-apocalyptic opportunity, the cigar-chomping and scandalous circus leader, the overbearing and violent army general, the drunken police captain, and his two toddling offspring. It’s an effective and arresting cast, all of whose thoughts are given light and life by Krasznahorkai’s deep and thorough prose. Indeed, the writing style is, perhaps, the novel’s defining characteristic. With no paragraph breaks, many-line sentences, and only the occasional chapter break, The Melancholy of Resistance unfolds as deliberately and as slowly as the evil Krasznahorkai uncorks in the final pages. He is adept at the internal monologue, the stream-of-consciousness narrative that begins outside of a character’s head, delves inside, runs back out, and then comes to rest on some proximately located inanimate object. In the same sentence. Over and over again. In that sense, the length of the sentences rival those of Henry James, yet they tend to be more playful, less formally organized, and subject to far fewer boundaries. Halfway into a Krasznahorkai sentence, you still have no idea where it’s going to end up. At its best, this is a liberating tactic: the deep paranoia, obsessive thinking, and fear of his characters could not be so effectively captured any other way. At its worst, the writing drags considerably and makes for uninviting reading. Unless you have many uninterrupted hours, Melancholy is a slow read that begs to be put down (for a rest), but not picked up (due to inertia). If you stop, you forget; if you break the flow, you’re out of the current. This is a book best read in long, deliberate stretches. Ultimately, the mixed bag tips toward the positive. For all its structural impediments, Melancholy does end up being a quick read if you stay after it and the investment-payoff quotient is highly compelling. This is not, however, the type of book that I can recommend to a wide audience. If you like your fights postmodern and experimental, then this is certainly one worth having. If the prospect of infinite sentences is daunting to you, then the interaction with the novel’s darker substance is not going to resuscitate the work. I give it a qualified endorsement.